Several small American hate groups are stepping up efforts to spread local variants of “identitarianism,” a movement born in France in recent years that preaches opposition to multiculturalism, often taking shape in the form of anti-Muslim xenophobia. While Identitarian groups on both sides of the Atlantic claim their opposition to multiculturalism isn’t racist, their direct action tactics and end goals indicate otherwise. Put simply, identitarians want regions and nations that are different from one another — but at the same time culturally and ethnically homogenous within their borders. The American efforts are particularly targeted to young people, much as they are in Europe, where the movement featured a 2012 “Declaration of War” indicting the generation known as “68ers,” a reference to the French left-wing radicals of 1968. But in the U.S., where some activists have mirrored that call by attacking the “baby boomer generation” for supposedly selling out the country to foreigners, there isn’t much evidence that this latest version of racist ideology has caught fire. Still, U.S. efforts are multiplying. At least four American groups are pushing versions of Identitarianism, often parroting the words and the flashy, youth-oriented style of the Europeans. The most important of them, the National Policy Institute, recently held a “Why I’m An Identitarian” essay contest. The ideological roots of the Identitarian movement go back to the French “New Right,” and mix elements of European chauvinism, biological determinism, fierce localism and even typically left-wing ideas like Swiss-style direct democracy and criticism of capitalism. Still, the eminent scholar of fascism, Walter Laqueur, has described it as fundamentally a doctrine closely related to fascism. 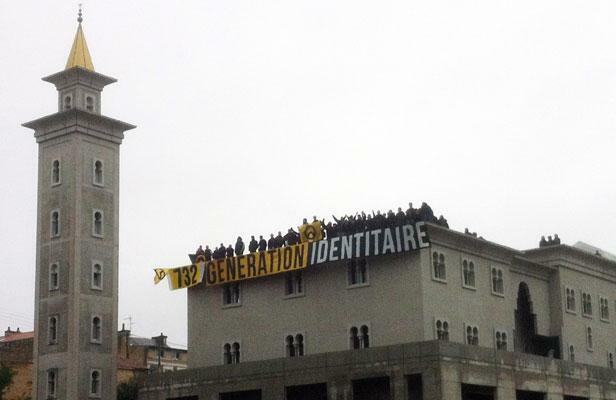 Its organizational expression came, in the early 2000s, in Generation Identitaire, the youth wing of the Bloc Identitaire, a French anti-immigrant coalition that also opposes “imperialism, whether it be American or Islamic.” Bloc Identitaire became known in recent years for trying to serve “identity soups” in Muslim neighborhoods. The soups, containing pork which practicing Muslims cannot eat, were a mocking publicity stunt that drew widespread accusations of racism and xenophobia. The French Identitarians really came to public notice, however, with two more recent actions. In 2010, it held a massive “pork sausage and booze” party in Paris that the Christian Science Monitor described as “a deliberate provocation against Muslims.” Although originally set for a Muslim neighborhood, it was moved to the Arc de Triomphe after the first venue was banned. Significantly, it was held on the anniversary of Charles DeGaulle’s 1940 call for an anti-Nazi resistance. And in 2012, about 70 activists dramatically invaded the site of an unfinished mosque in Poitiers, where they unfurled a huge banner reading “732 Generation Identitaire.” The number referred to the year in which the Frankish king Charles Martel turned back the invading Moors, who were Muslims, near Poitiers. The Identitarians also demanded a referendum on halting immigration in France. The French Identitarians — and to a lesser extent, their counterparts in Germany and Austria — also became known for their slick media efforts. They made videos showing dozens of white people speaking out against Islam and immigration, and also of flash mobs of silent anti-immigrants marching eerily down city streets. The American Identitarians haven’t come close to matching some of the more dramatic efforts of the Europeans, especially when one compares the size and impact of the street demonstrations, but the Americans are making some real efforts. But it was forced to change its name when Generation Identitaire insisted that the situation in America was different and therefore it would not recognize the group as a U.S. chapter. Today, the site is only one page explaining the name change to Identity Vanguard. NPI does more than talk. The group regularly hosts conferences featuring radical-right speakers in both the United States and Europe. Last year, it organized a major racist conference in Budapest, Hungary, called the “European Identitarian Congress.” But once the event got some advance publicity, the Hungarians decided to shut it down, even jailing Spencer for five days before deporting him. The claim is hogwash. In fact, Heimbach regularly interacts with open white supremacists like the Imperial Klans of America, the neo-Nazi Golden State Skins, American Renaissance magazine, and the League of the South, whose leader recently wrote that the South is “White Man’s Land.” Over the last year, Heimbach and Parrott also have authored a six-part series inspired by the writings of Corneliu Codreanu, the late Romanian fascist, assassin and Nazi sympathizer. In one of those essays, the pair described the ideal activists as “warriors for the Cross,” reflecting their emphasis on Orthodox Christianity as a basis for their racial activism. That differentiates their view of Identitarianism from that of their European counterparts, who do not generally see religion as a central issue. The National Youth Front (NYF) is another group that is toying with Identitarian ideas. The group is the youth wing of the American Freedom Party, which includes in its ranks most of the better-known white nationalist intellectuals in America. The NYF is headed by Angelo John Gage, who sees Generation Identaire as his inspiration and has been working to spread its ideas on college campuses. While it’s unclear how much success Gage has had in his recruiting efforts, they have been enough to get the attention of some Europeans. He has been invited to address nationalist groups in Sweden and the United Kingdom later this year. All of this activity is a reflection of increased contacts between the American and the European radical right over the last several years, especially within the younger ranks, as the idea of a multinational movement to “defend” whites has spread. While the American Identitarian copycats might not be the most successful propagandists, at least so far, they are part of a racist and anti-Muslim movement that is increasingly international in scope.